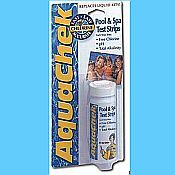 Aquachek 4 way test strips keeps you informed of how balanced your pool water is. Takes as little as 30 seconds. No more vials, reagents and messy drops. Use Aqua Chek's simple, yet accurate test strips instead of that complicated liquid test kit. Just dip and read the results in 30 seconds. Test your pool water daily to ensure that your pool water chemistry is balanced and your water is safe for swimming. This is the first, most important step to proper pool care. The 3-Way strips test for Alkalinity, pH, Free chlorine and Cyanuric Acid.